Football has been generating a lot of revenue from different sources year on year, and it's got even bigger with the help of sports marketing agencies on the look-out for any means possible to milk a sponsorship deals. The Premier League has been a real money spinner, generating revenue from naming rights, advertising, shirt sponsorship, kits sponsorships, endorsement etc. Recently, even sleeve sponsorships were even introduced. The biggest clubs across Europe keep negotiating for higher shirt sponsorship deals. Real Madrid are reportedly in negotiations with Fly Emirates for a better deal, commensurate or higher than that of FC Barcelona and possibly Manchester United. Manchester United seven-year sponsorship deal with American auto brand Chevrolet is now the mark to beat for the biggest European clubs. The deal started in 2014/15, churning out about £57 million in shirt sponsorship deal for away and home jerseys, adult and children every season. This is aside the record £75 million kit deal the club has with top sportswear brand Adidas. This helped fund several of the clubs targets, even when they were out of the Champions League. FC Barcelona sought for a better deal, hence they dumped Qater Airways for Rakuten. The new four-year deal with the Japanese coy rewards them with £47 million per season. Premier League defending champions Chelsea earns £40 million every season in a deal with Yokohama Tyres but Arsenal have eclipsed them with a new Emirates deal which will be a little over £40 million. Bayern Munich pull £25 million per year, which is more than that of Real Madrid’s deal. With the Madrid deal set to lapse at the end of this season, the back to back European champions are expected to get a new deal north of £45 million per year. All sort of brands are taking up sponsoring deal with various clubs in the top leagues. ICT superweights, auto companies, top industries, betting and gaming brands etc. And it is not just the Premier League getting all the lucrative deals. EFL Championship side Ipswich Town recently entered a deal with top casino brand, worth £2 million with The Stride Group which will be another revenue stream for the Championship outfit. The three and a half year shirt sponsorship deal mean the brand ‘Magical Vegas’ will be emblazoned on all the club’s first team shirts from the start of new season until 2020/21. 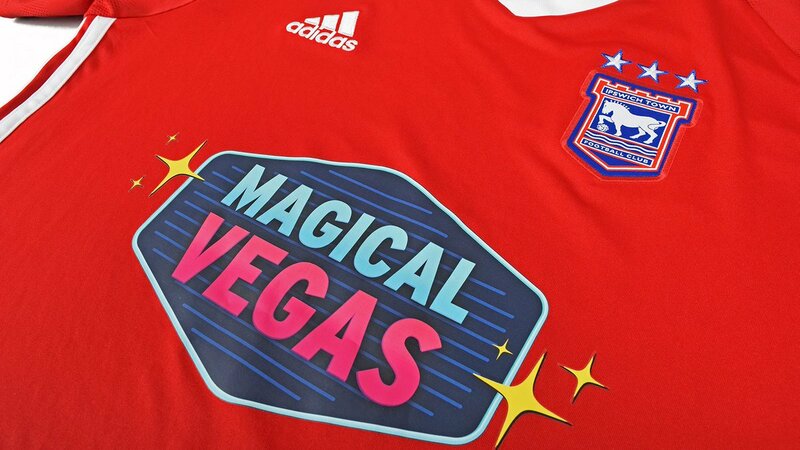 For the rest of this season, fans will see the Magical Vegas casino logo on Town’s red away shirt instead of the Marcus Evans Group logo. Those who earlier purchased the club away jersey will reportedly have the Magical Vegas logo overprinted free of charge! Aside paying out huge fees to have their logo adorned by the biggest clubs, top brands now ensure they use distinct logos to separate them from competitors. Recently sports agency UED Sports (that sponsors La Liga side Real Betis) clashed with OPE, which sponsors Premier League side Huddersfield Town, claiming their logos were too similar, even though they played in different leagues, in diffferent countries. They complained to the Premier League but the league said the matter was not relevant to them, asking them to direct their grievances to Huddersfield and their sponsor. When you pay top dollar for sponsorship, you need to make sure you're getting the ful reward for your money.